One of the best parts about the holiday season is all the upscale holiday soiree invitations that flood our inboxes. From cocktail parties to work events, the amount of festivities are endless. While switching up your look with dresses and accessories is one way to standout amongst the crowd of eggnog happy partygoers, we prefer taking our styling skills to our tresses with easy to use products and tools from Amika. 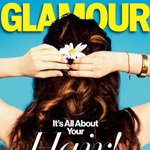 Our current favorite is the series of styling tools that create the luscious waves you see at left. The curl kits comes with a hydrating conditioner and curl serum as well as the best curling iron we've ever used. With three different detachable barrels you can create large loose waves, tight springy curls, or a mixture of the two! Step 1 — Prep the hair with Obliphica Hydrate Conditioner, it gently detangles and leaves the hair soft, manageable and voluminous. Let you hair air dry or blow it dry with a dryer. This look can be done on any texture of hair. Step 2 — Using the medium sized barrel of the amika Tourmaline Triple Barrel Curler, take small sections of hair, curl them and then pin them into place against the head. You can add texture and variation to the look by curling some sections with the smallest barrel as well. Once the curls have cooled remove the pins and brush them out lightly with a comb. If you like you can add a small braid to the front for a playful accent. Step 3 — Apply a quarter-sized amount of the amika Curl Defining Cream to the palms and scrunch your curls from the bottom. The cream will add smooth separation and shine to your curls without weighing them down. Brava! You did it! Now go treat yourself with a glass of champagne!